I bought 3 potted Calla Lilies early spring. They looked great, but one of them has totally changed its leaves. They are green and with sharp points like spears. What caused that to happen? 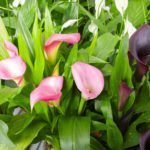 Calla Lily produce longer leaves and a more spear shaped leaf on a flower stalk.